Grab the next mile and ride with confidence. General Tire’s new SUV All Season tyre combines SUV specific toughness with reliable performance in all weather conditions. 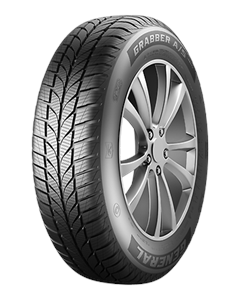 The Grabber A/S 365 features solid shoulder blocks in longitudinal direction and delivers high levels of grip that leads to short braking distances on dry roads. Extra wide grooves evacuate slush and water from the contact patch, efficiently increasing safety and aquaplaning resistance. The optimized sipe technology in the central part of the pattern provides excellent traction in slippery conditions and short braking distances on snowy and icy roads.